Last year saw significant growth in the mHealth app market and in 2012 the market size will nearly double. That’s according to the latest findings from mobile research company, Research2Guidance. The smartphone application market for mobile healthcare will reach US$1.3 billion in 2012 – up from US$ 718 million in 2011. Yet despite this substantial growth, the mHealth market is still in an embryonic state – especially in comparison to the US$ 6 trillion of the overall global healthcare market. Several factors, especially smartphone penetration, will continue, however, to drive mHealth market growth over the next couple of years, reckons Research2Guidance’s Mobile Health Market Report 2011-2016 report. Revenue streams from downloads, in-app advertisements, mHealth services, direct transactions and sensor sales will all grow substantially, it is predicted. And in 2012 the number of mHealth application users – mobile users who downloaded a smartphone mHealth application at least once – will reach 247 million compared to 124 million users who downloaded mHealth smartphone applications in 2011. The technical aspects of the healthcare landscape are changing rapidly and fundamentally. Healthcare data, the number of healthcare apps and their usage on mobile phones is growing and it is all evolving around smartphones and sensors attached to the phone, claims the report. Research2Guidance’s report, Mobile Health Market Report 2011-2016, describes in a detailed 100 pages the impact of smartphone applications on the mHealth industry. It has been designed to help decision makers in the healthcare market to understand the current status of the market, learn about best practices and get insights on future trends and market potentials. For more information click here. 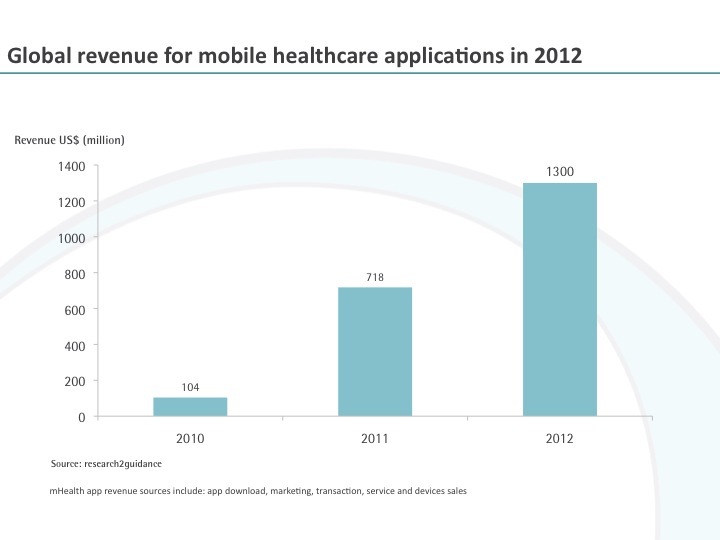 One Response to "The Market For Mobile Healthcare Applications Will Grow To US$1.3 billion in 2012"